We’ve talked about pentatonics on LJS in the past both on the blog and on the podcast. 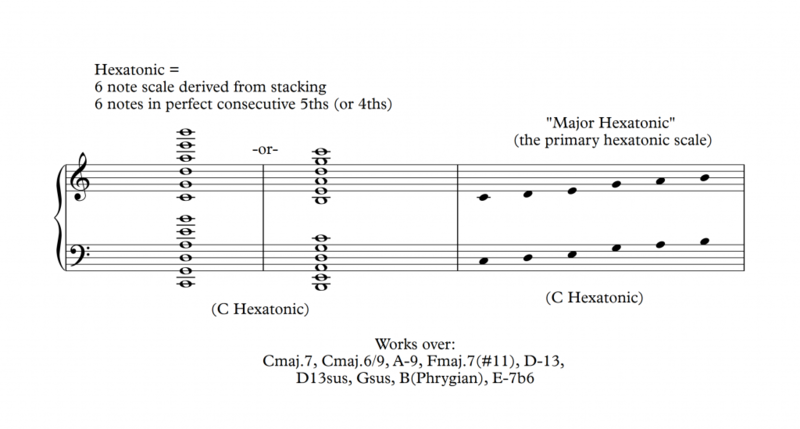 In this post, I want to build on the concepts surrounding pentatonic scales and talk about a useful hexatonic, or 6-note, scale. After introducing the hexatonic scale, I’ve included a 1-chorus pentatonic/hexatonic workout over the chord changes to “Dolphin Dance” by Herbie Hancock. Before checking out the exercise, you might want to review my post about the last 4 bars to “Dolphin Dance” to help understand my note choices over the last phrase of the form of that tune. 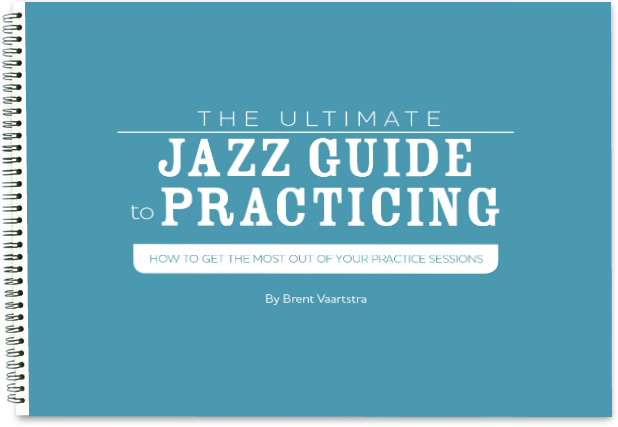 First off, let’s review why pentatonic and hexatonic scales are useful tools for jazz improvisers. Pentatonic and hexatonic scales are ancient musical constructs that pervade music from various cultures across the globe. They’re especially useful and prevalent in jazz because of their close relationship with the “blues scale,” and because of the predominant West African influences on jazz, among other reasons. 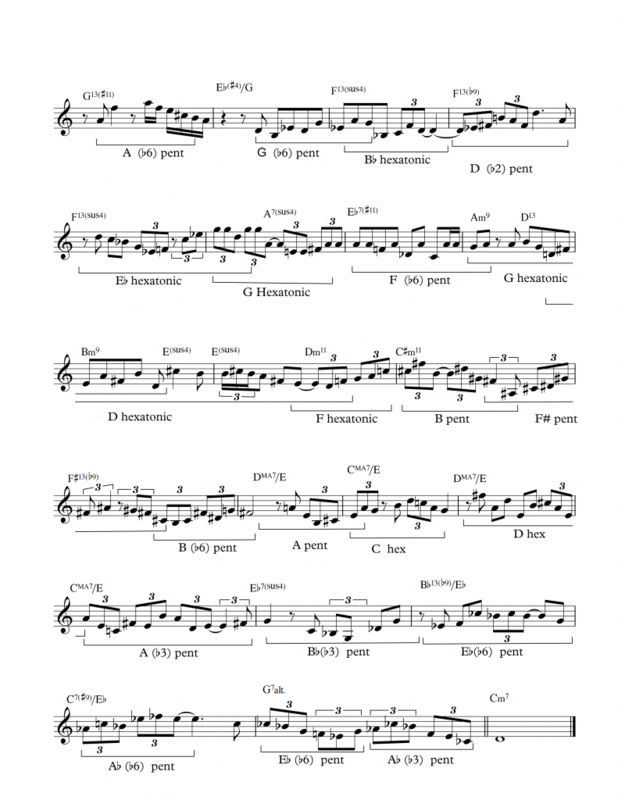 The great thing about major pentatonic/hexatonic scales is that they allow for simple, tuneful melodies that sound focused and clear because they rely on so few pitches that are close to each other in terms of perfect 5ths. Perfect 5ths are often viewed as the most “consonant” sounding intervals next to the octave according to many musicians who theorize that the whole number ratios of the frequencies of the pitches of octaves and 5ths make them sound “pleasing,” “relaxed,” and/or “soothing” to many ears. Since pentatonic/hexatonic scales are made from pitches in stacked perfect 5ths, it follows that they generally are “consonant” sounding scales when played by themselves, but the context in which you use them makes a huge difference in terms of the overall perceived consonance/dissonance of the scale. What’s unique about the way you can use major pentatonic/hexatonic scales is that, since they essentially limit your note choices relative to the 7-note “church modes,” they allow you to explore one part of a scale/chord while strategically omitting certain pitches. So for example, if you play D major pentatonic or a G major hexatonic scale over a Cmaj7(#11) chord, you hit all of the “colorful” tones or “juicy notes” while avoiding the sometimes more “boring” or “bland” sound root and/or 5th, which are probably being played the bassist anyway. Note that what you end up with is essentially a C major scale without the “problem” note: the perfect fourth, the F-natural in the key of C. F-natural is usually a pleasing sounding note to land on for a Cmaj.7 chord because it clashes with the 3rd by creating a ½ step rub between the 3rd and 4th scale degrees. Of course, notable exceptions to this general guideline include playing a perfect 4th above a major 7th chord if the 4th is part of a chromatic or diatonic surrounding tone or passing tone gesture. Additionally, if it is a modal Cmaj. Ionian chord, for example a Cmaj. (add4) or Csus(maj.7,add3), then the diatonic 4th can usually be a pleasing note to emphasize. 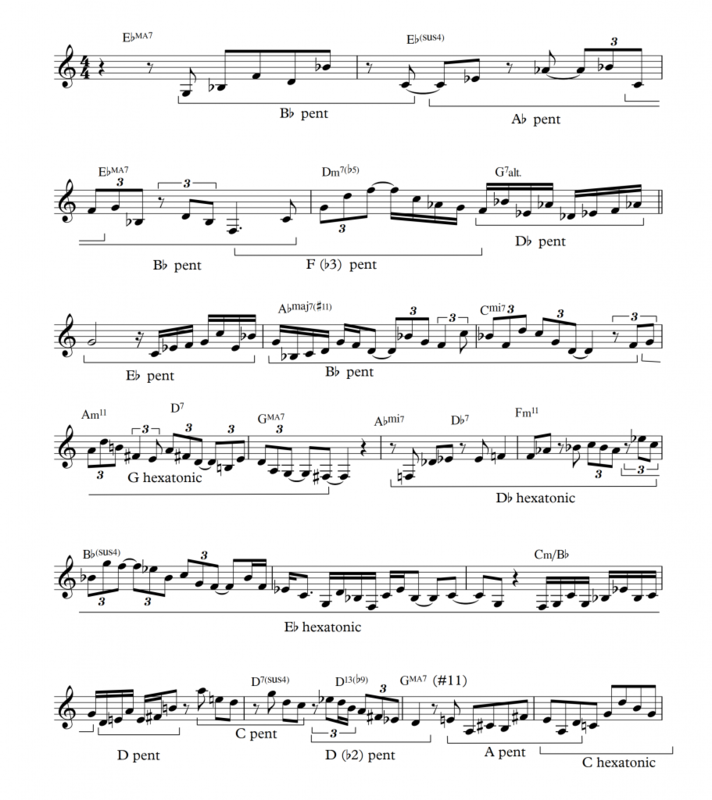 But in general, when most mainstream playing jazz standards, the perfect 4th is not generally a pleasing note to sit on too long or to emphasize over a major 7th chord unless it is immediately resolved down by step into the diatonic 3rd. Pentatonics and hexatonics allow you to strategically limit your note choice and playing simple, pleasing melodies that “float” over the changes and cross over bar lines. 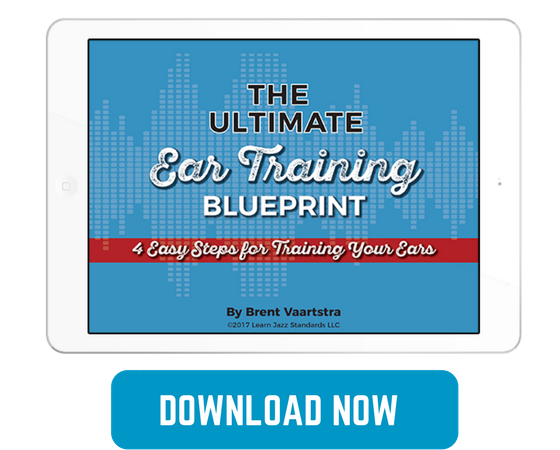 It allows you to leverage common tones between chords to simplify your melodic ideas into more compact and cohesive statements rather than having to constantly switch modes between every chord change. With that in mind, here’s a “solo” (or “exercise” or “workout” or however you want to conceptualize it) I wrote over “Dolphin Dance” using only pentatonic and hexatonic scales with an emphasis placed on trying to come up with scales that allow the improviser to play a single 5- or 6-note scale over at least 2 different consecutive chords. Hope you enjoy digging into this solo. Feel free to study it and pick it apart slowly. 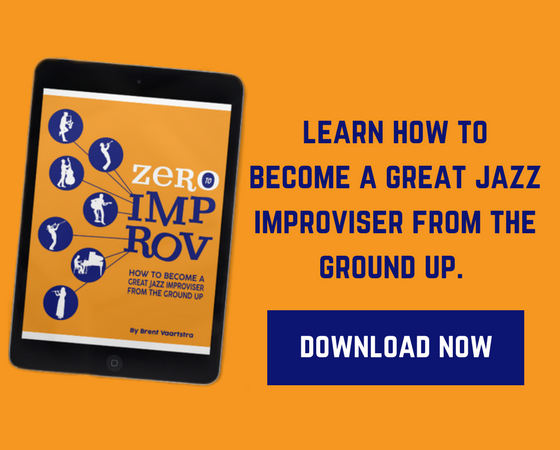 These can be very useful concepts for making your jazz improvisation more creative and interesting.